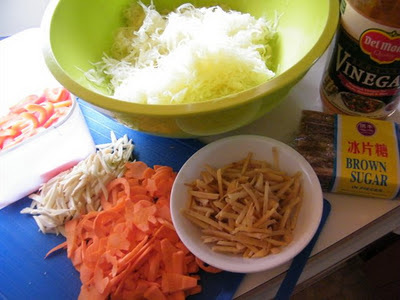 The first thought that came to mind when I saw the frozen packs of shredded papaya at the Filipino store was atchara. Excited with this find, I immediately phoned my mother-in-law and asked her the rest of the ingredients so we can make some for home consumption. 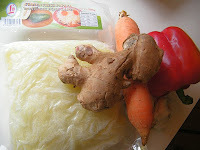 What is strikingly different with her atchara recipe from the others is in the preparation. For other pickled veggies, you arrange these in the bottle and then you fill it up with the hot, pickling liquid. My mother-in-law has a different approach. It works wonderfully though. 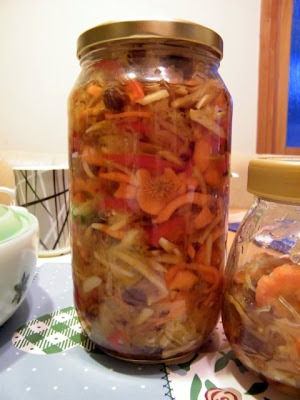 We've had some guests over for meals and they have tried the pickled papaya and they just love it. 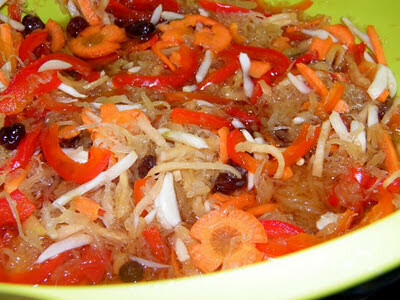 Atcharang Papaya is served in small portions after a meal. 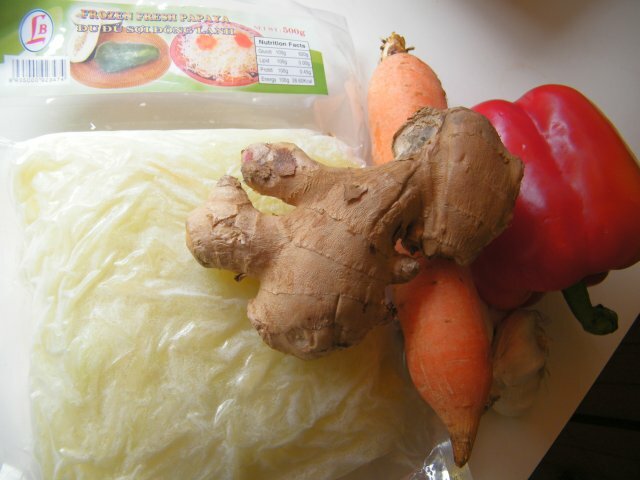 While it helps cleanse the palate of greasy after-taste of fried meat and fish, it can be consumed after any dish. Mix the red cane vinegar with the brown sugar in a pot then place over medium heat. Mix until sugar has dissolved. 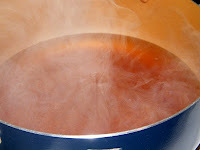 When this starts boiling, remove from heat to cool down. 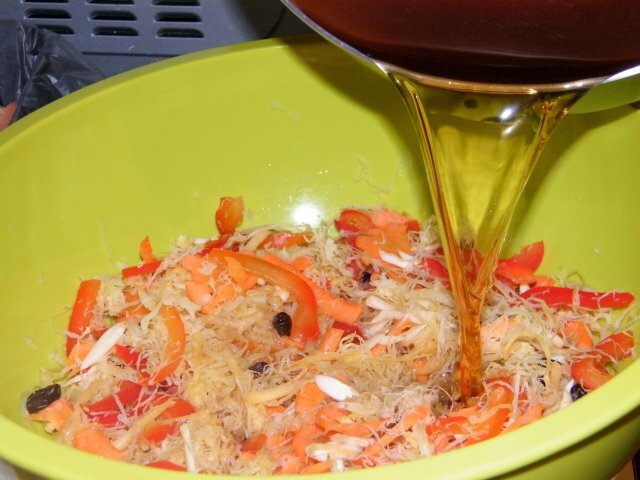 Squeeze out as much liquid as you can off the shredded papaya (we used a net and by batch for this). 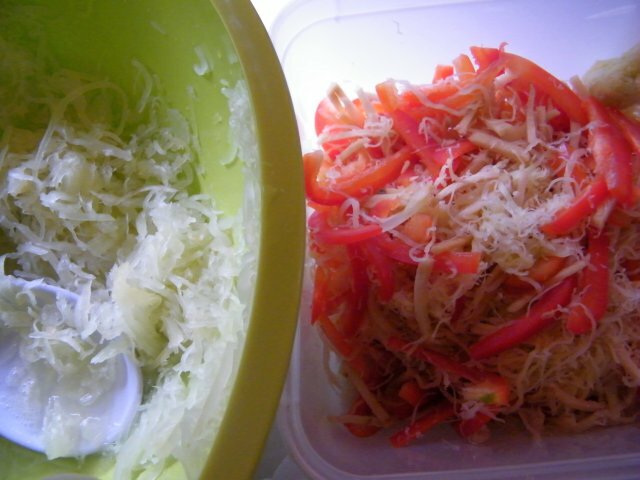 Mix the papaya with the capsicum and garlic strips. Squeeze out the juice once again from this mixture. Add the raisins, carrots, and garlic and mix to distribute ingredients evenly. Pour the vinegar - brown sugar mixture. Le this stay in the bowl overnight. The shredded papaya will be rehydrated with the pickling liquid. Store in bottles the next day (vinegar mixture included) and serve as desired.